I shared earlier on this blog the benefit of using a personal, “Public Profile” on Facebook over a Fan Page on Facebook to personalize the experience and grow your network. I encourage each of my clients to, when they have the choice, choose the public profile over the Fan Page for personalities in the company for the reasons I shared earlier. It personalizes the company better, and I think the opportunities to grow organically are stronger. 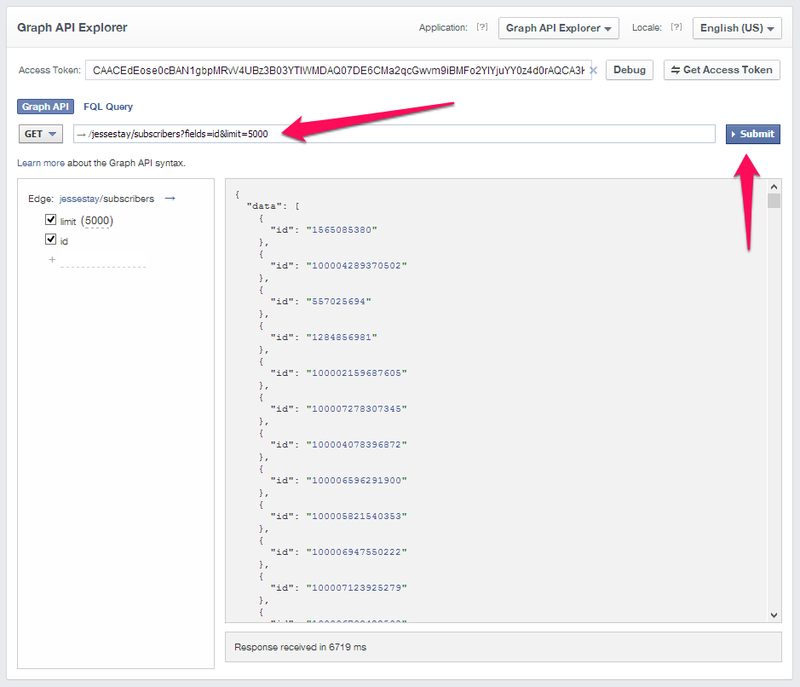 The trick involves just a little Graph API (the Facebook developer platform used to get data out of Facebook). 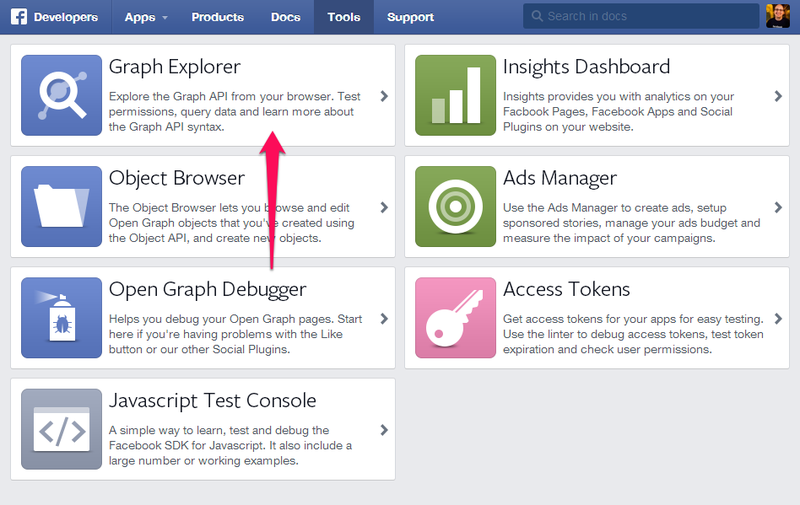 To start, open up Graph Explorer from the developers.facebook.com “Tools” section. Give your user the “user_subscriptions” permission by clicking on the “Get Access Token” button and checking the box under “User Data Permissions”. You can replace “jessestay” with the id of any public user. The limit=5000 lets you traverse through the more subscribers at a time. Hit “Submit”, and a bunch of data will be returned. This script took me about 15 minutes to write on my own, so it’s not too difficult a task if you have a little programming knowledge. Of course, this is also a service I provide to my clients so let me know if I can help! Once you have this file, you’re ready for the next step! Now that you have your file, you need to upload it to Ad Manager as a “custom audience”. This used to only be available to Facebook’s Power Editor, but it’s now a native piece of the Facebook Ad management experience. Start by going to http://facebook.com/ads/manage and make sure the account you’re using is selected (for those that might manage multiple accounts like me). On the left is a link that says “Audiences”. Click on that. Now, click on “Create Audience”. A dialog box will appear – select “Data File” from the dialog box. Now name your audience whatever you like, and choose the file you just created in the above section. If it’s a text file that has a Facebook ID on each line of the file it should work. Also, make sure you select “advanced options” and “user ids” so it recognizes your ids as Facebook ids and doesn’t try to read them as email addresses. Click “Create Audience”, and now your custom audience should be created! Pretty quickly you’ll start seeing the number of potential people you can target show up next to the audience stats on this page. Now that you’ve created your custom audience out of the user’s subscribers, you just need to create an ad that targets this custom audience. This is where you’ll need an existing Facebook Page for your brand (Not the user themselves – to me Facebook Pages are for brands. Facebook Profiles are for users!) if you want to do a promoted post. If you don’t want to use another Facebook Page you can just do a right-nav ad that targets a URL and that will work too. Start by creating a promoted post using Ad Manager, or on the Page itself (don’t use the “boost” option!). You can make this visible or invisible to your fans – it’s up to you. 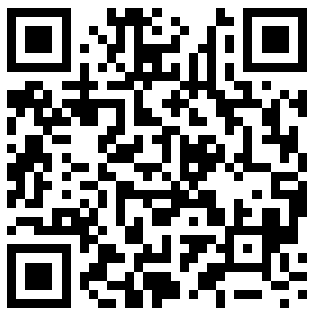 Include a link if you like, just text, or whatever you want. Maybe even put the image of that user in the post so it’s recognizable to the fans of that user. 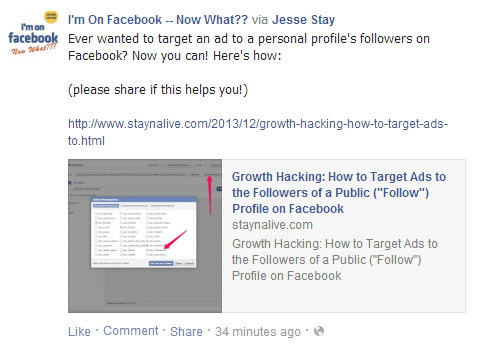 Another option is to have your Facebook Fan Page share a post of that user, and then you can promote that! 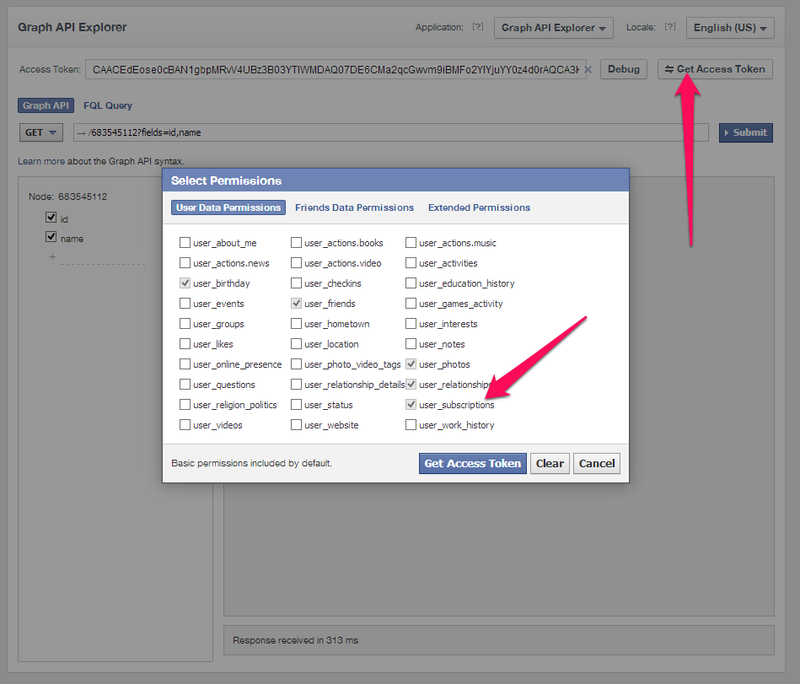 Then in your targeting options, select the custom audience you just created. You can further refine the audience if you like, should the post be needed to target a specific subgroup of that audience (allowing for much stronger micro-targeting and perhaps even better results for less cost). Set all your bidding options, submit the ad, and now you have an ad targeting all the followers of a specific user on Facebook! The great thing about this is you don’t have to limit it to subscriptions – it works with any data your user has access to. You can access your friends, your friends’ friends. You can target the attendees of an event you’re going to. Or members of a group you participate in. You also don’t need to limit it to your own user if you’re targeting just followers. Because public profiles are public, you can target the followers of any user that has their profile marked as public! 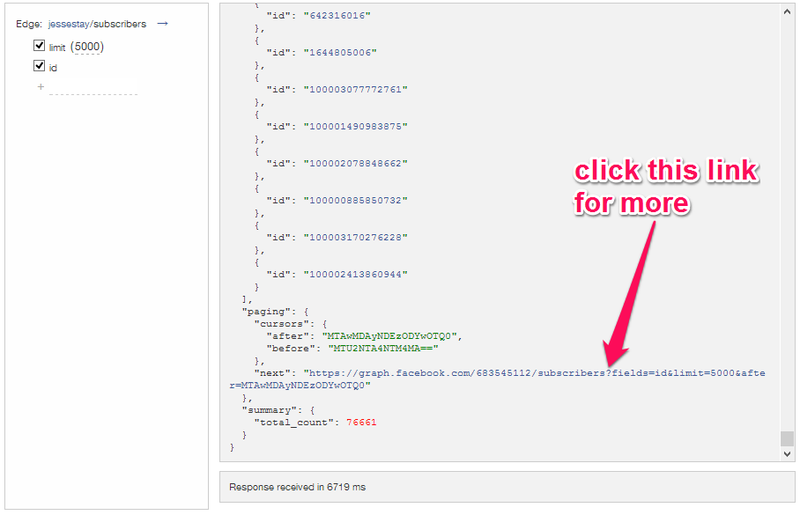 Just a side-note: I did notice a bug in Facebook’s Graph API that doesn’t return all of the subscribers. I think it excludes subscribers that are subscribing to you through Facebook lists. It will return most though, which makes an ad campaign totally worth it! So when you think you have to use a Fan Page because you can’t advertise on a public profile, think again! You indeed can target subscribers of public profiles on Facebook, making the use of a public profile even more powerful, and something every brand should consider! Let me help your brand! These little “Growth Hacks” are the core of our business, and how we excel against other marketers and firms in this space. If you want to get an advantage against your competition that other marketers can’t touch, send an email to jesse@staynalive.com! My team and I offer quality hacking services. We can decrypt or recover any E-mail, FACEBOOK or websites servers and grant our client’s access. We always provide proof before payment. You can mail us at “greyhatshadowhacker2002@gmail.com”. We always reply our client’s as soon as possible and execute the project with the quickest frame-time possible. I met this wonderful hacker that offers hacking services.